Horse trailers come in many styles and sizes. If you only have one or two horses, then you're unlikely to need more than a two-horse trailer. A smaller truck and trailer combination is a bit easier to learn about hauling with too. When shopping for your first horse trailer, you’ll need an idea of what is available and what you need your trailer for so you can match a trailer with your needs. 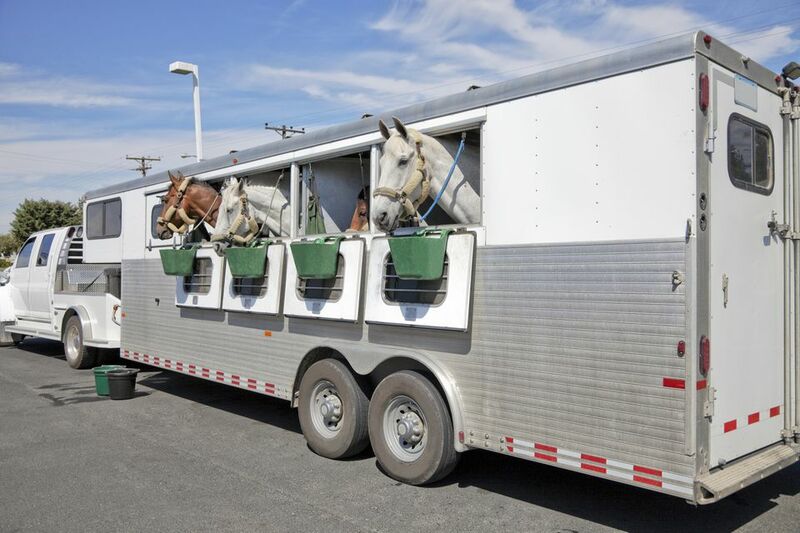 Here are the basic facts about horse trailers and their materials and design. Bumper pull or tag along trailers attach to your truck via a hitch affixed to your truck’s frame, that comes underneath the rear bumper. Bumper pull trailers can haul up to four horses depending on the trailer and truck size. These trailers are sensitive to the push of the wind, the movement of the horse and may tend to sway. They are a little harder to back up than a gooseneck. They’re called bumper pulls, but they aren’t actually attached to your bumper. Gooseneck trailers are heavier than tag-alongs and may need a larger truck with a truck bed hitch to haul. They are easier to handle than a bumper pull, and you might not notice the movement of your horse or wind. Because they are heavier, you’ll end up using more fuel, but if you’re often hauling more than two horses, a gooseneck might be your best choice. 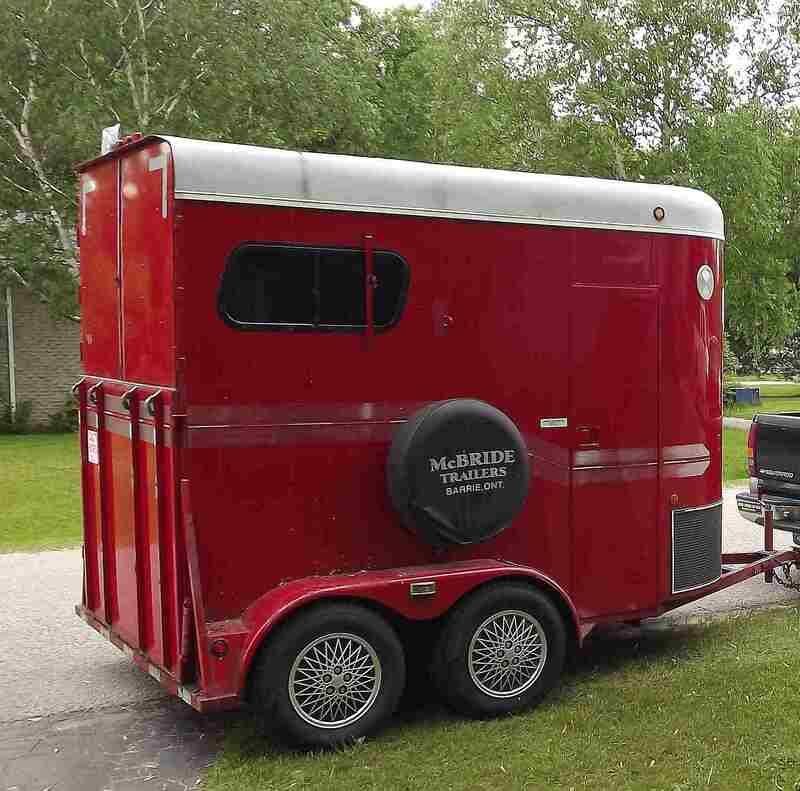 Height and width are important when you are looking at horse trailers. Your horse should be able to stand with its head at normal height and not have to skooch down when being hauled. Larger horses need wider trailers. Trailers come in pony-to-draft horse size so choose according to the size of horses you’ll be hauling. Too much space, especially head-height space, is better than too little. Stock trailers are essentially open boxes with no partitions or stalls between the occupants. In a stock trailer, you can tie the horse on an angle or frontwards. Some stock trailers, depending on the size, have a gate so that there are two box stall areas. Many horses that don’t like to ride in a horse trailer will be more willing to ride in a stock trailer because they are brighter and more open. When considering a stock trailer, be sure it’s high enough for horses, as many are made for cattle and have a low roof. Straight load trailers haul horses with their heads forward and their tails to the rear of the trailer. A few types of straight loads haul the horse with their heads backward. This may be easier on the horse because they can use their haunches to brace when you are braking and accelerating. It is essential that you don’t put a horse backward in a regular straight load trailer. Straight-load trailers hold two or more horses. Slants give you more space for storage and living quarters and you can fit more horses on a smaller trailer, depending on how the stalls are designed. There are two types of slant load trailers. In both, the horses stand at a 45-degree angle to the road, but in a reverse slant load, the horses are facing more backward. Some horses may be more comfortable in this arrangement because they can use their stronger haunch muscles to brace when you put on the brakes. For long-distance hauling, this may be less tiring for the horse. On the downside, it's harder to get to a horse in the front stall of some slants, should the need arise. Trailers may have a ramp for loading horses. A ramp may seem like a good idea, and many trailers are made with them, but they may not be ideal. A ramp gives a hesitant horse more time to think about getting onto a trailer. You have to bend and lift to put the ramp into place, putting you in the way of a horse’s heels. And, ramps can be heavy to lift. Horses that are sticky about loading may actually be less hesitant to hop onto a step-up entrance and there’s no heavy door/ramp to fall or kick down. Some trailers require the horse to step up to load. This is often easier than encouraging a horse to walk up a hollow sounding ramp that may feel like it’s flexing underfoot. Step ups might encourage a horse to rush as it hops up, however, so it’s important to teach your horse to load quietly no matter what type of entry the trailer has. Steel trailers are common. They tend to be heavier than aluminum or fiberglass combinations, but they are sturdy and in an accident offer some protection. To prevent rust, they should be well maintained and stored in a dry place. Aluminum is light and bright, but if it needs repair, fixes can be expensive and tricky. Some trailers have areas to store your gear. This is very handy if you’re showing or trail riding off your yard. Living quarters or ‘LQs’ allow you to travel with your horse long distances, overnight at horse shows, or camp on the trail. Many trailers with living quarters offer the same comforts as a regular camping trailer.